Position in the periodic table:Aluminum is a 'p' block element. It belongs to period 3 and group III A of the periodic table. Aluminum is a bluish white shining metal. It is the lightest metal and its specific gravity is 2.7. Its melting point is 6600C and boiling point is 18000C. It is a good conductor of heat and electricity. It is malleable and ductile in nature. Aluminum reacts with dilute hydrochloric acid and dilute sulphuric acid and to give hydrogen. Aluminum has no reaction with dilute and concentrated nitric acid. Aluminum is used for making utensils, frames, electrical appliances, etc. It is used for making electrical wire. It is used for making alloys and coins. Its alloys are used for making sailboats, aircrafts, etc. It is used for making aluminum foils whichis used for wrapping food, cigarette, etc. The important ores of aluminum are bauxite, feldspar, china clay and caryolite. The physical properties of aluminium are: bluish white shining metal, lightest metal, malleable and ductile in nature, melting point is 6600C and boiling point is 18000C. Aluminium is used to make alloys and coins, make aluminum foils which is used for wrapping food, make utensils, electrical wire, frames, electrical appliances, etc. From bauxite to aluminum - or how a printing plate is made. C.1.9 - Describe the main properties and uses of aluminum and its alloys. Electrolysis: Extraction of aluminium from alumina in the Hall-Heroult Cell. Write in equations, what happens. i. Aluminum is heated with chlorine. Hydrochloric acid is kept in a glass or plastic container but not in a container made up of aluminum. Give reason with balanced chemical equation. Name the two ores of aluminum. The external cover of the airplane is made from aluminum instead of iron. Why is it done? Give two reasons. The external cover of the airplane is made from aluminum instead of iron because: a. Aluminum is lighter than iron. b. Rusting does not occur on aluminum while rusting occurs on iron when it is exposed in air. Aluminum vessels should not be cleaned with powder containing alkali, why? Aluminum metal is reactive elements so it reacts with alkali such as caustic soda or caustic potash solution to form meta-aluminate with the release of hydrogen gas. Therefore, aluminum vessels should not be washed with powder containing alkali. Write the balanced chemical equation for the reaction between dilute hydrochloric acid and aluminum metal. Which compound is formed from this reaction? Salt i.e. Aluminum chloride is formed from the reaction. What happens when i. Aluminum is heated in presence of chlorine. Aluminium belongs to ______ of the periodic table. Aluminum is a _____ block element. Which metal is obtained commercially by the electrolysis of salt? 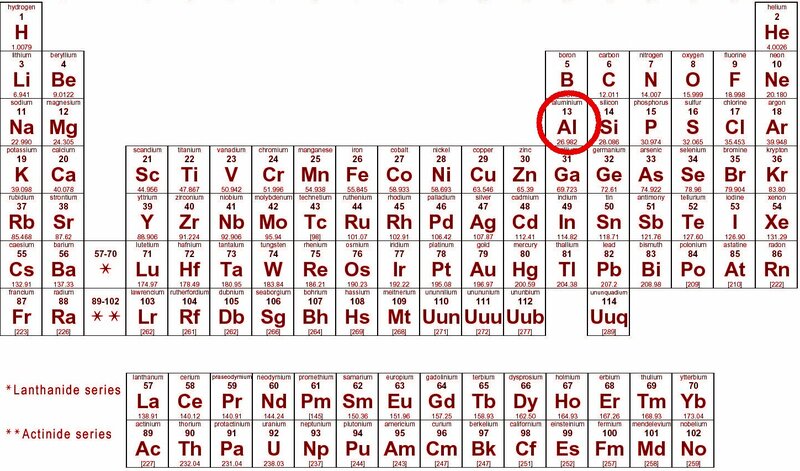 Aluminum is belongs to period 3 and ______of the periodic table. Which one is Important ores of aluminum? The melting point of aluminum is ______. Why aluminium tools are not affected by air and water?? Any Questions on 'Aluminum '?